Phoenix Community Band -- May Concert in H.S. 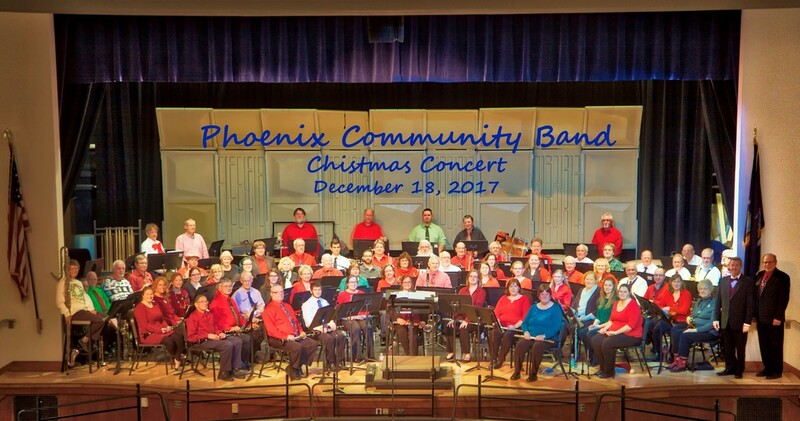 The Phoenix Community Band is one of the youngest civilian concert bands in the United States, and has been very well received by their audiences at their performances. The popularity of the band grows throughout the Central New York region, as evidenced by the support of the many enthusiastic listeners who attends its performances. The band is open to all post-high school members. Click on button link below for Registration Form. All concerts will be at the JC Birdlebough High School at 7:00 pm. All rehearsals will be at EJD Middle School regular time (check PCB website for directions, if needed). NOTE: No rehearsals in January unless needed for potential performance at the ACB Convention. Lake George -- Saturday, July 20, 2019 We play at 2 p.m. NOTE: If because of rain the concert needs to be cancelled. It will be posted on this website on the day of the concert. Also, TV stations 3 and 5 will be notified.